Lovely work for the challenges and the photos look idyllic. The cafe stops are the best. Just love that rusty heart on your tag, and as usual the photos are stunning. Your hand carved image looks very elegant and tactile with those stitched edges. Your digi tag is super, just look at all that rusty goodness. Superb photography and is that a dragonfly I see?? Fabulous. Non alcoholic Beer or Cappuccino they both look just as inviting Happy T Day. I'm guessing you mean that you carved the African lady stamp, Valerie. She's marvelous! Great photos from Hariksee. I was surprised to see the children paddling rafts so near the swans. What a treat for the kinder. I associate swans with "Swan Lake" - my all time favorite ballet. The last two photos brought "Swan lake" to mind. Your art is fantastic...so beautifully crafted!!! Gorgeous, gorgeous photos. Normally I have a hard time choosing a favorite but this time the one with the rowboat caught my breath...stunning!!! wonderful art as usual, and I especially love the outdoor photos- fabulous!! Happy T day! I am in LOVE with that tag. Rust is my friend, so I was really impressed. I also adore how you put your new hand carved stamp to such good use. It is beautiful. I was especially impressed by what looked like Banyon trees in one of the photos. I was impressed by the swans and the photo of the children on the lake. Wonderful scenes. Looks like you enjoyed your time there, and that alcohol free beer may have been something I might have enjoyed, but I think I'll take a cappuccino instead. Thanks for sharing your art, your photos, and your drinks with us for T this Tuesday. Wow! Great artwork! Love your stamp creation and the heart tag! So beautiful!! Gorgeous pictures from your walk! I love place to visit! Great captures of the ponies,the rooster and the goats! Lovely green scenery! I love beers !!! Wishing you a lovely day and a happy week! Hugs! You have certainly been busy and produced some wonderful artwork. Looks like you're having great fun, out and about in glorious weather. Particularly liked the boats! Great to see the boat as your header Valerie. Wonderful new stamp with so much character you created. The tag is just amazing and looks so real. What a wonderful and inspiring idea to photograph the sheet. Very nice place to enjoy a drink with the peace of the lake and wonderful birdlife--I am picturing sitting there right now. We have squarking starlings this morning because I bought a fat ball thing and hung it on the fence--not sure if that was a good idea. I'm in awe of your stamp making skill - that's a stunning image. Love the way you've used her - the sewing is perfect! Amazing photos, too - so good to see the sunshine everywhere at the moment. 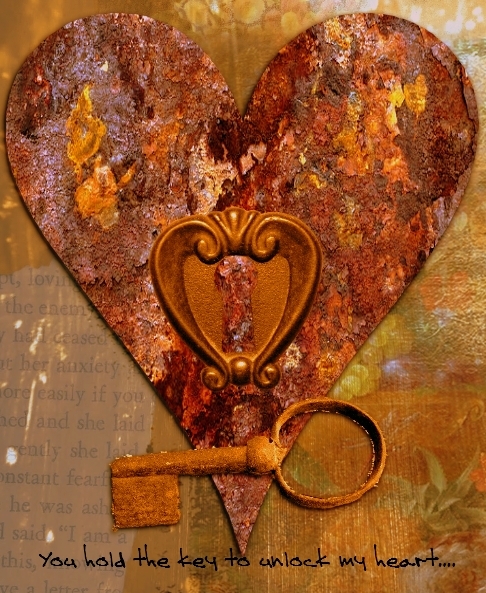 Lovely pieces Valerie - I especially love the grungy rusty key and lock tag. NICE pieces. If I had to pick, the key intrigues me. Look at all the critters! Beautiful! I really love the key piece and the rusty look of it. Very cool. Gorgeous photos too. I wish they sold alcohol free Erdinger beer here. I love that beer but am not a huge fan of alcohol. This way people can enjoy a beer even if they are driving. Fantastic art, I love your lady stamp, and wonderful photos Valerie! Fabulous tag with your handmade stamp, it's a great image. Love the rusty look of your key tag and thanks for sharing more of your photos from you walk, how peaceful it looks. You created an awesome tag with your hand made stamp. She is a very stylish and elegant lady, she for sure has 'the look'. The tag is fabulous as well wonderful rusty effects. The photos from your walk are lovely, scenes that look calming, giving a feeling of a peaceful tranquility . Happy T day wishes Valerie, I'm sure you will have enjoyed stopping for your coffee as you were out and about. Oh your stamped lady is wonderful and dynamic! I love your tag too and your photos are lovely. I love both but that heart -- super wow! It's fabulous -- love the rust. And as for your other photos, well, I could happily dive into that water right now! Fabulous! LOVE both art pieces! The rusty tag really got me. Beautiful photos out and about. Love the farm critters. oh my gosh both are amazing art pieces, so beautiful, lovely photos as well, i am catching up with everyone!! I have missed you!!! I love your African lady with the fringe! Such a great hand carved stamp. Beautiful photos. Those lily pads are a favorite. Really gorgeous artwork Valerie and your hand carved stamp is fabulous. Great photos too and lovely to see so much nature. I enjoyed seeing your African lady, beautiful pose. 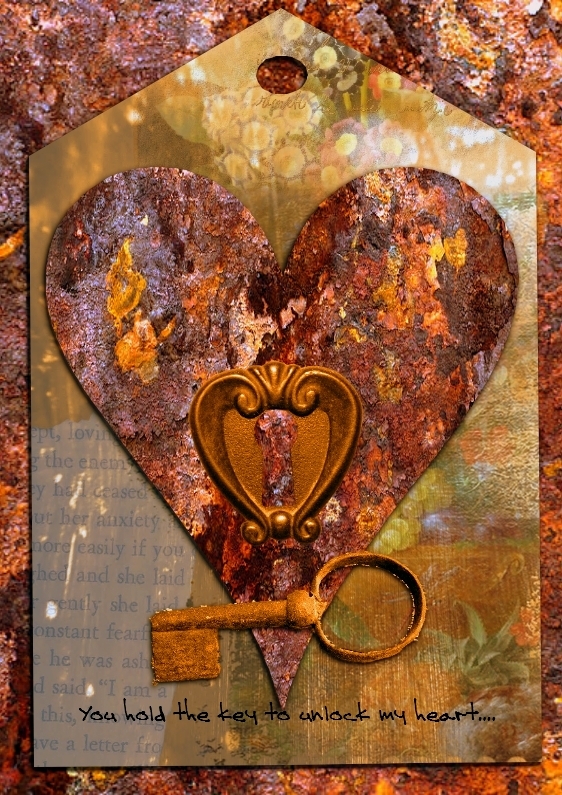 Also the gorgeous key to heart tag, so lovely and textural. Your key and heart TAG have such lovely colors in them. Beautiful! Your photos are lovely. I love the lily pad shot- especially with the friend it has taking a ride. :) Looks like fun travels. Love both pieces of art! They are beautiful! Gorgeous photos!!! Love seeing all the animals! Big Hugs! Leopardskin, jewellery and fabulous fibres... she's definitely got the look! Amazing rusty heart too, and I'm glad the sun came out for your trip in between the thunderstorms. Beautiful artwork and those Lake photos are lovely Valerie! Looks like you and George are having a splendid time together- good for you!